Small, perfectly formed, but how much power does this nettop pack? Maybe it's because we're massive geeks, but whenever we get our hands on a video streaming/telly box we're always wanting it to act a bit more like a proper media centre. Plucking those ephemeral TV waves out of the ether and streaming all our content from our desktop PC is all well and good, but sometimes you just want to quickly pop up a browser or switch over to Sky Player or 4OD. And that's where Novatech's Mini ION netbox is looking to make its mark. It's one hell of a streamlined wee box and no mistake. It stands a mere 25mm tall and manages to pack in a fair amount of power into such a small chassis. Essentially it is just a dual-core netbook minus a screen but that's not necessarily a bad thing, especially when you can stick a full version of Windows 7 on there without the netbook Starter Edition restrictions. This £339 version includes the full OS, but you can also opt to pick up a box without the Microsoft loving for almost £100 less if you've still got an XP licence hanging around or want to take that step into the wonderful open source world of Linux. There are a host of distributions specifically designed for the media centre work this box is likely to spend its life carrying out, and all for free. It depends though how much you are willing to get your hands dirty configuring all the necessary drivers and coping with the foibles of the free OS, and how much the ease of having a pre-installed, and familiar, Windows 7 means to you. Is it actually worth that £90? That said the ageing Atom 330 at the heart of the Mini ION ain't too powerful. Dual-core and quad-threaded it is, but even propped up with Nvidia's ION graphics platform playing full 1080p video is a bit of a chuggy affair. That, and the fact that you're going to have to have a keyboard and mouse plugged into the box, plays into the hands of those video streaming media boxes, like the AC Ryan PlayOn! DVR 1TB we've already looked at. Unless you're willing to fork out a fortune on a decent remote keyboard/mouse setup then the traditional remote still has it. So in the end it all comes down to what you're actually going to be using it for. The Mini ION is a decent little machine and will happily sit as a media centre if you're averse to the whole 1080p malarkey. A dedicated player though may be more worthy of your attention. 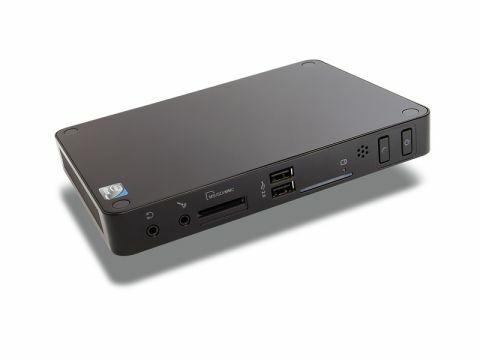 It still can't be missed that despite the ageing tech, being able to pack a full PC into a box this small is to be applauded and at £250 without an OS its ideal as a secondary, bedroom machine.